Since 1983 freelance dance teacher, dancer, choreographer and movement analyst. Certificate in Laban/Bartenieff Movement Studies (CMA) in Seattle, Washington, USA (1984). Bachelors Degree in Dance at Empire State College, New York. Certificate as a practitioner in Movement Pattern Analysis by MOTUS Humanus, Denver, USA. Certificate in Movement and Bodywork, GALA/Gaia University. She is a co-founder of the Tanzfabrik Berlin and worked 10 years as a dancer, teacher, choreographer and organizer. She is a founding member of EUROLAB e.V. and worked for 12 years in the executive committee. Since 1992, she has taught at several nationally recognized dance trainings and at various universities. In 2001 she was a guest lecturer at the University for Music and Performing Arts, Frankfurt. In the summer of 2003, she was guest professor at the University of Hamburg, in the Department of Sports/Movement Science. 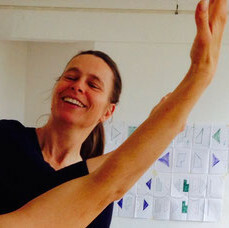 2000-2013 she taught at impuls, Bremen, a vocational school with state recognized degree, mainly the subjects dance improvisation and bodywork. Since 2002 she has performed solos almost every year in various contexts (among others, “Tanz Bremen”). She is a part of the steering committee of Global Water Dances and has directed the performances in Bremen (2011) and Bremerhaven (2013). She has published several articles and a book in German ( "Bewegtes Wissen"). A recent article in English was published in „BODY-LANGUAGE-COMMUNICATION, an International Handbook on Multimodality in Human Interaction“, 2013.